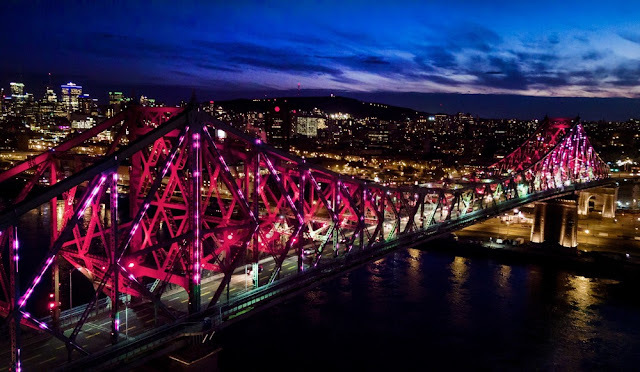 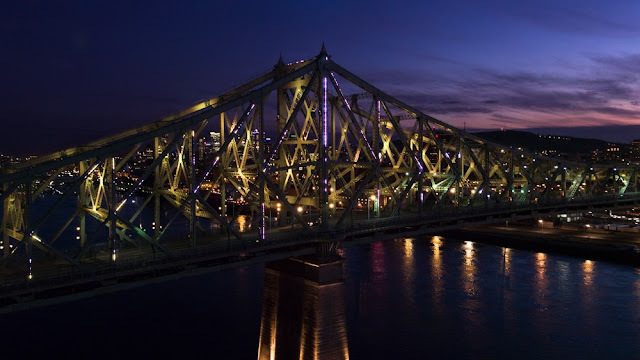 An iconic architectural feature of the Montreal skyline by day, the Jacques Cartier Bridge now shines with an innovative lighting signature that celebrates the unique engineering of its historic structure. Thanks to intelligent programming connected in real-time to big data and social media networks, this bridge is by most measures the most connected bridge in the world. 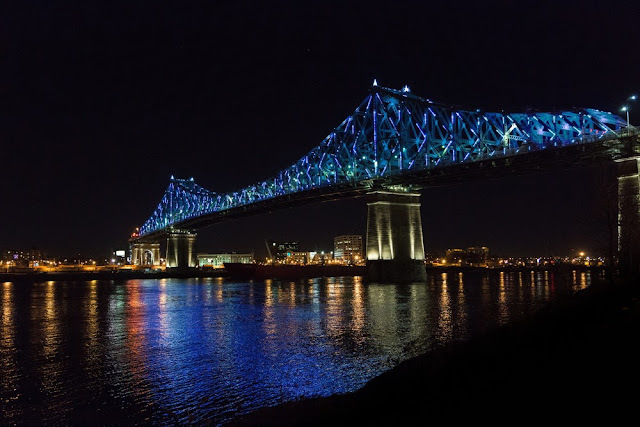 It comes alive every night and changes constantly, in synch with Montreal’s seasons, weather, traffic and social media activity. A flagship project for the city’s 375th and Canada’s 150th anniversaries, the illumination of this steel colossus was a major challenge. 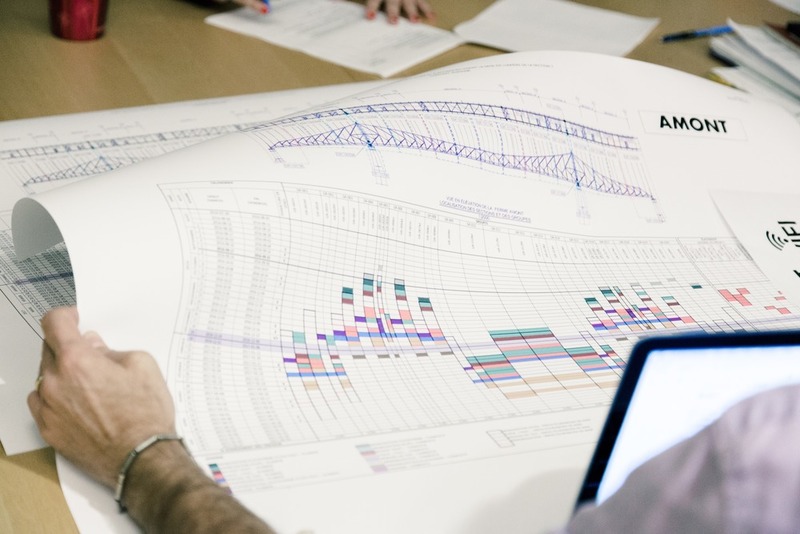 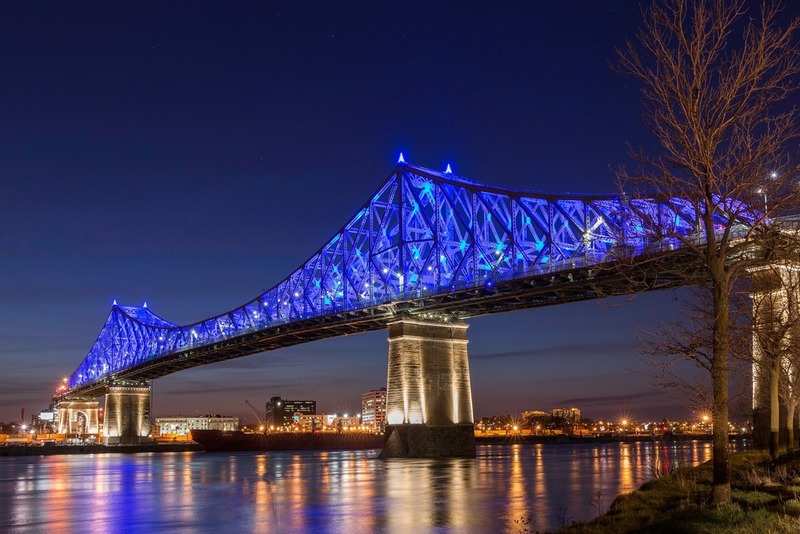 This project unites the bridge with the city and its citizens, by combining expertise in civil engineering and large-scale project management with the creative talent of Moment Factory and six world-class local design firms. 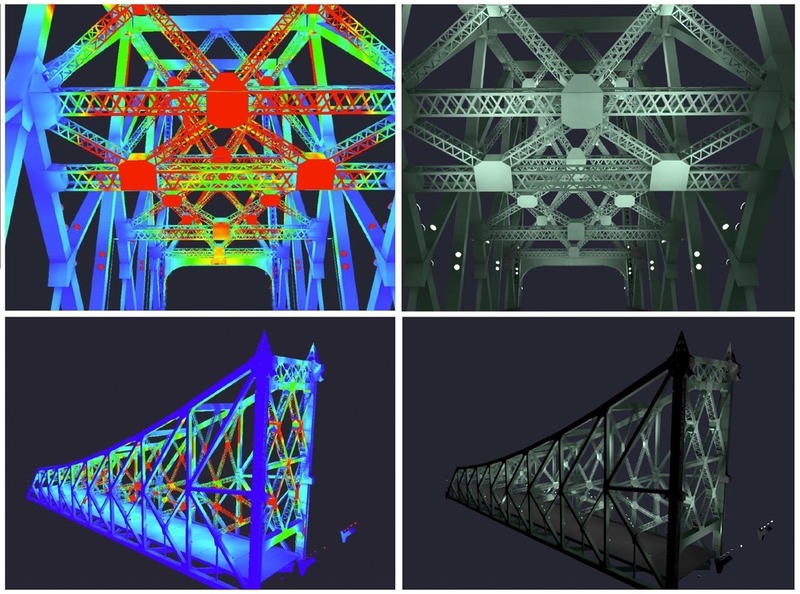 + Lighting directed to four areas of the bridge’s steel superstructure: piers, turrets, interior core or “heart”, and exterior facade or “skin”. + A soft lighting is directed inwards towards the ‘heart’ of the structure, minimizing light loss and distractions to vehicles. 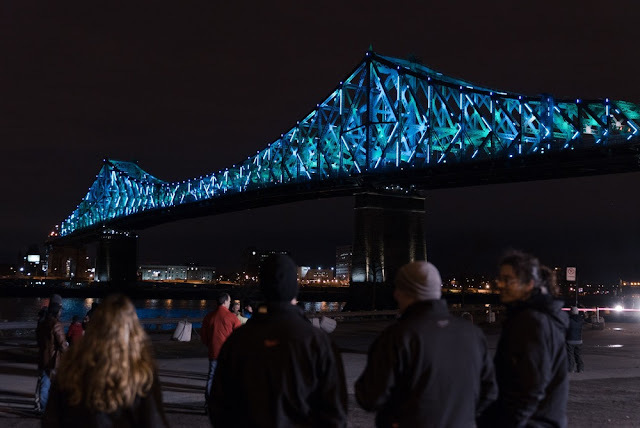 + Art concept created by Moment Factory in collaboration with six Montreal multimedia and lighting studios: Ambiances Design Productions, ATOMIC3, Éclairage Public / Ombrages, Lucion Média, Réalisations and UDO Design. 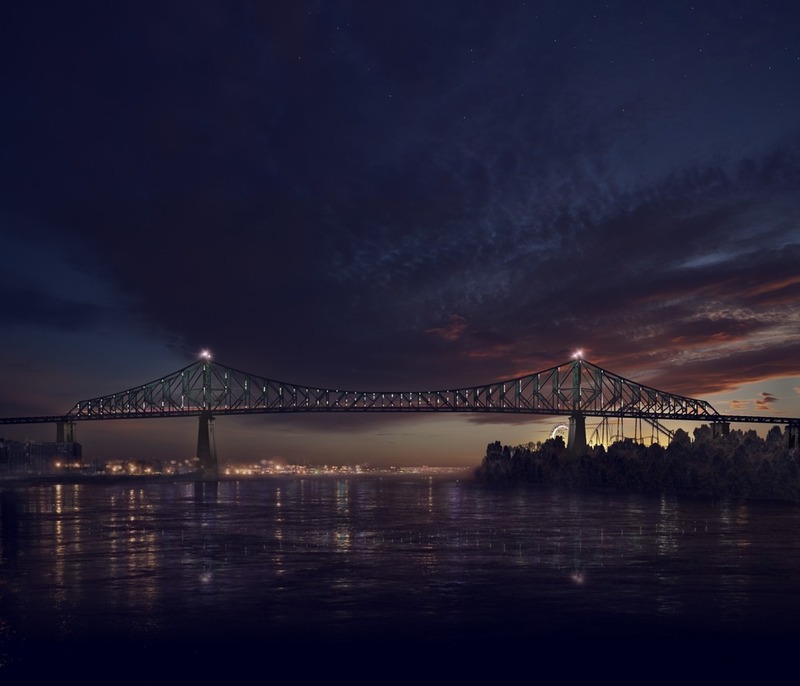 + Project management by The Jacques Cartier and Champlain Bridges Incorporated. + Engineering work done by the consortium WSP–AECOM. + Lighting system installation by Pomerleau. An iconic landmark by day, the bridge takes on a new life at night. As the sun sets, the bridge awakens, bringing light, movement and data to the structure. 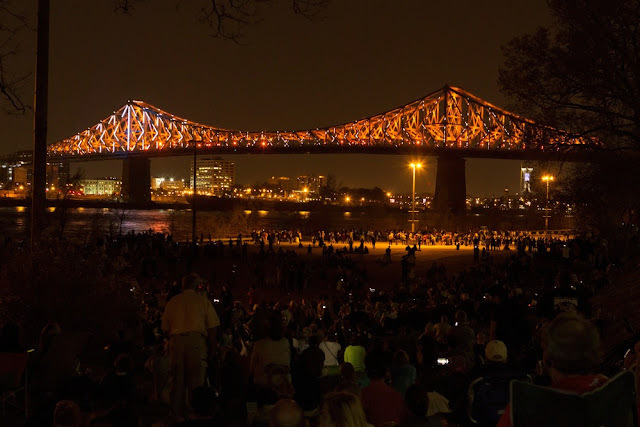 Over the course of the night, the bridge uses these features to tell the evolving story of Montreal and its ongoing rhythms. 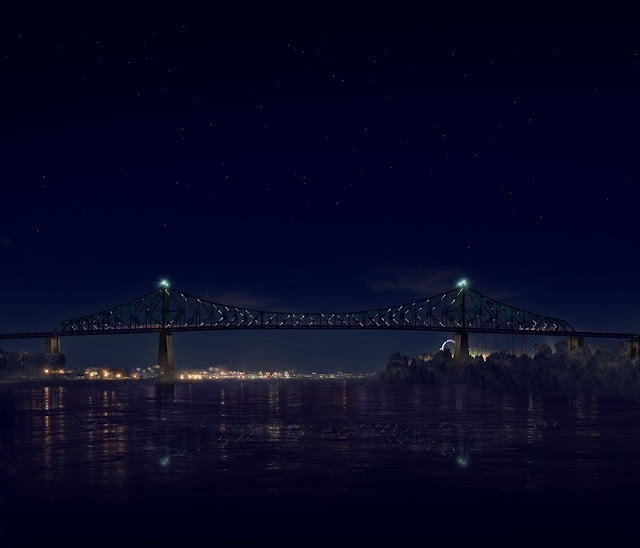 The following morning, as the day breaks, the bridge’s pulse fades into the sunlight, waiting for its next turn to shine. The energy of Montreal is represented through a subtle play of light on the bridge’s exterior ‘skin’. For 52 minutes each hour, the bridge pulses with the city’s social conversations as tracked on Twitter in real-time. 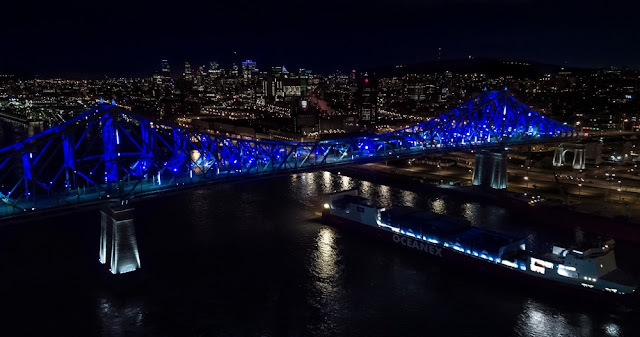 The intensity, speed and density of these light fragments changes depending on how often Montreal-related hashtags are liked and shared. 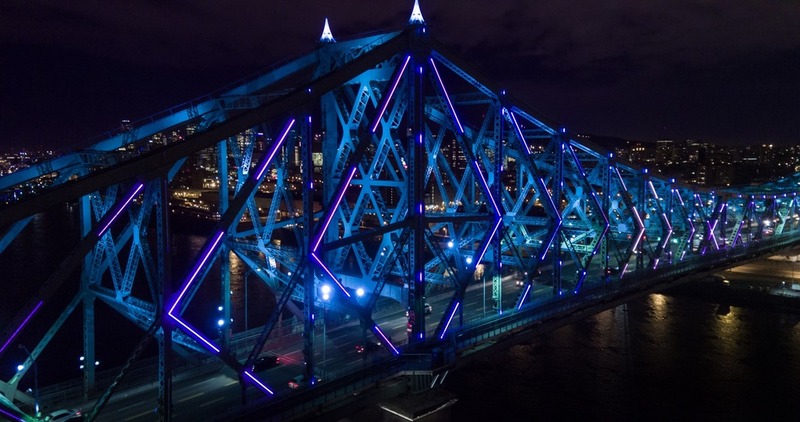 Viewers create a unique coloured spark by sending a Tweet directly to the bridge’s own dedicated hashtag #illuminationMTL. 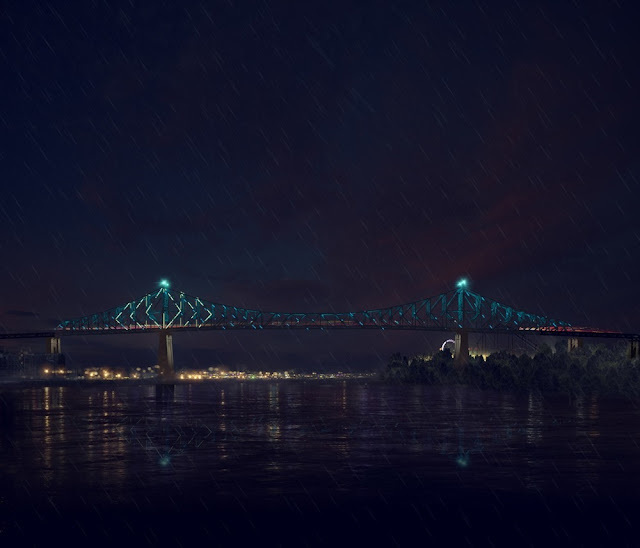 On every hour, at night, short 8-minute animations create a Big Data-driven show that visually translates Montreal’s activity and mood based on different types of daily data: the weather, traffic, news, major events, and more. 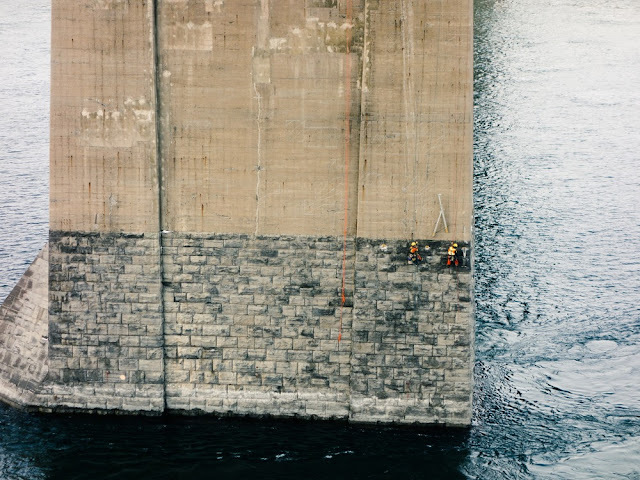 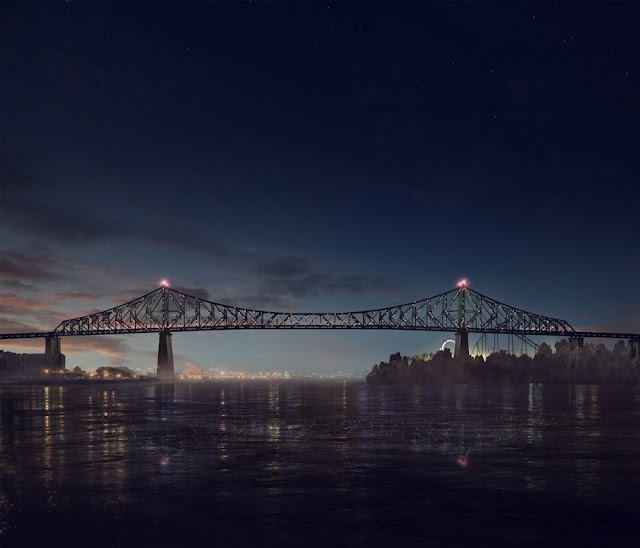 This changing content makes the bridge a true barometer of Montreal life. As the seasons change, so does the light. The bridge changes hue with the seasons thanks to a 365-colour calendar. Day after day, the bridge’s ‘heart’ gradually changes from an energizing spring green to a radiant summer orange, a voluptuous fall red, and finally an icy winter blue. 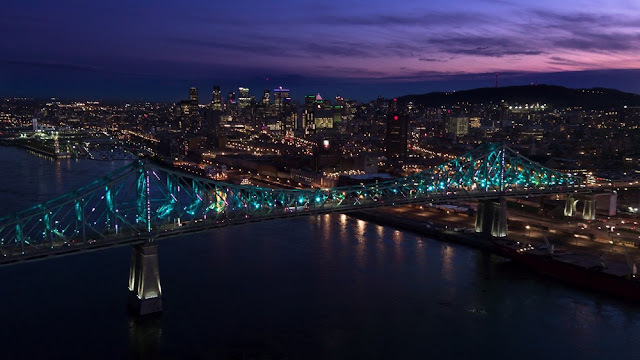 Like the forested mountain after which the city is named, the colours change gently with the seasons, the light subtly evokes the passage of time as an enduring artistic expression that reflects its surrounding ecosystem. 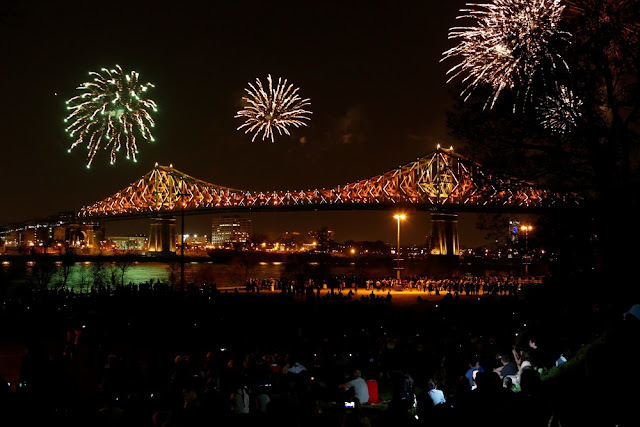 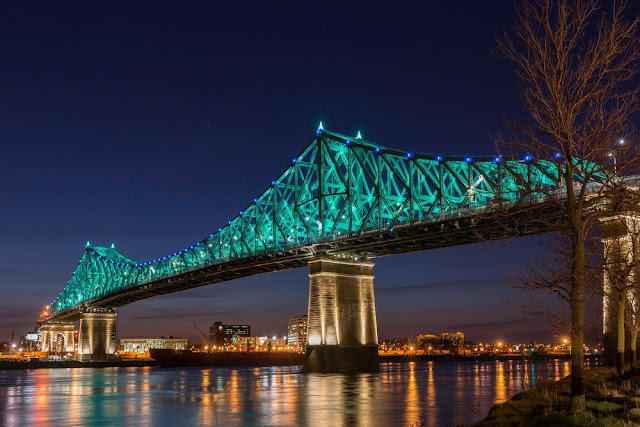 + 87 YEARS : the Jacques Cartier Bridge has been a Montreal icon for close to a century, a jewel of civic heritage, and a source of pride for Montrealers since its inauguration in 1930. 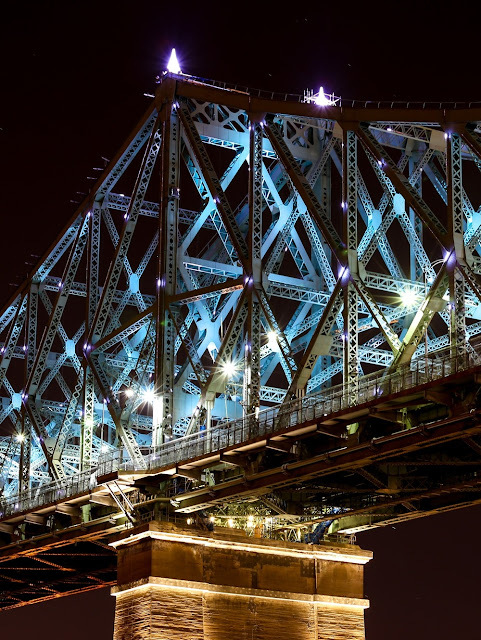 + 600 METERS LONG + 15,650 TONNES OF STEEL: a true iron giant, the bridge’s superstructure definitely pulls its weight! + 2x LARGER : THE EIFFEL TOWER is 300 meters in height & contains 7300 tonnes of steel. 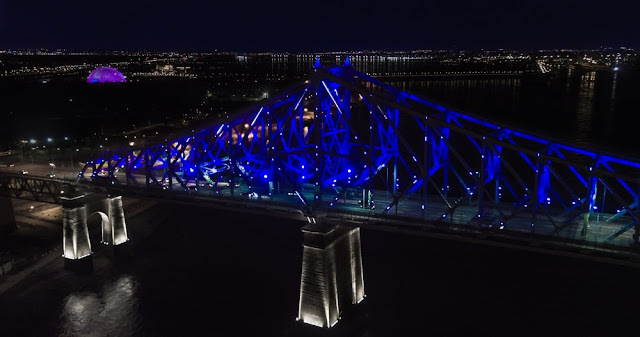 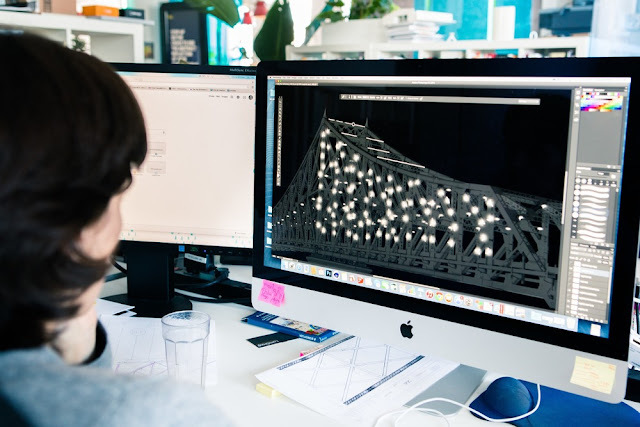 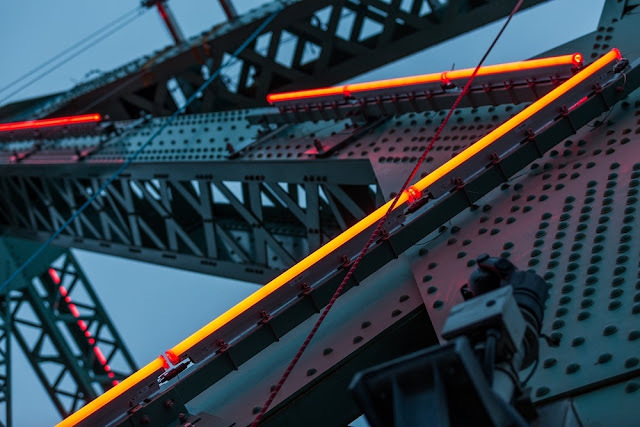 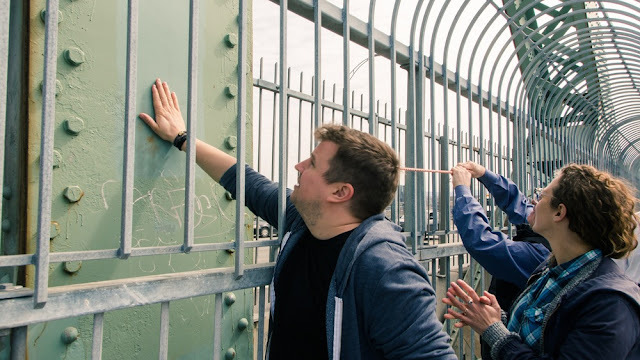 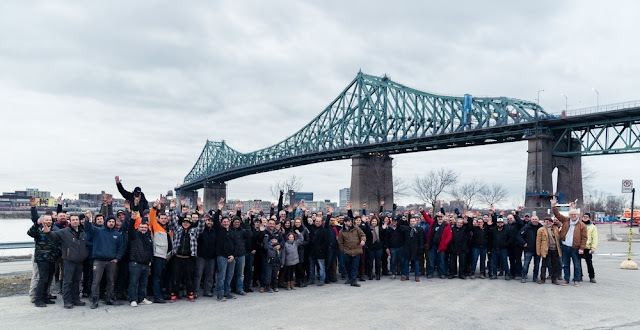 + OVER 250 PARTICIPANTS from all professional backgrounds worked on the bridge’s lighting for over two years (creatives, engineers, lighting designers, project managers, programmers, rope access technicians, steelworkers, electricians, traffic officers, and more). 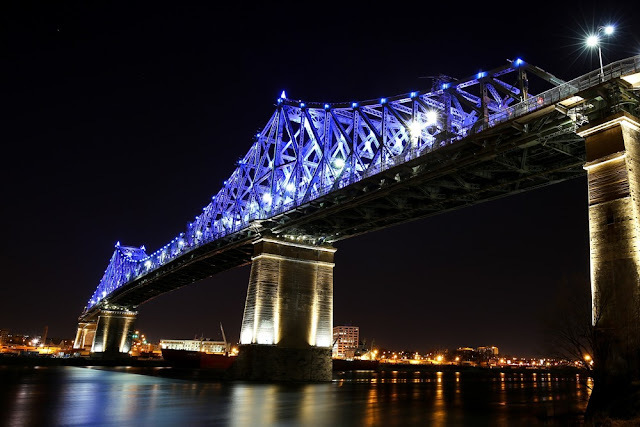 +10 YEARS: of operation and maintenance were secured in the illumination project budget. + SENSORS : Sensors installed on the bridge track vehicle, bicycle and pedestrian traffic, as well as wind speed, wind direction and precipitation levels. 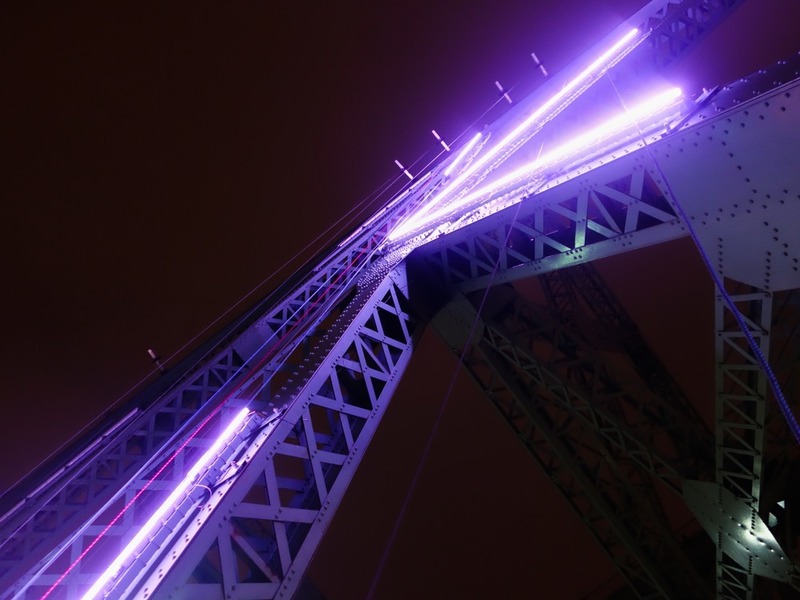 + UP TO 500 LIGHT POINTS, representing the most recent and most-liked TWEETS, circulate simultaneously on the bridge’s skin. 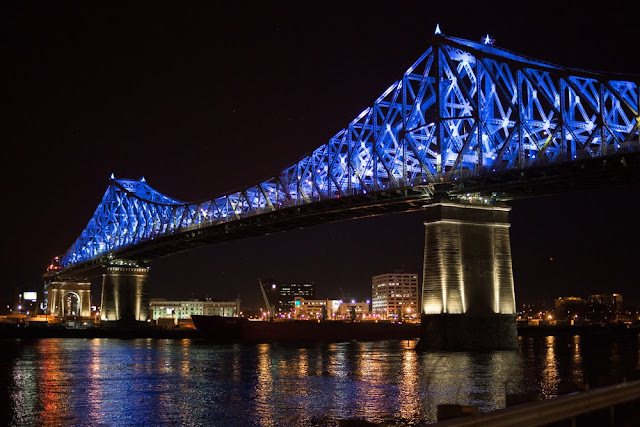 + 2,807 LIGHTS: a combination of projectors and tube lighting illuminates the steel superstructure to reflect the activity of the city. + 50,000 HOURS: estimated minimum lifespan of the energy efficient LED lighting technology. 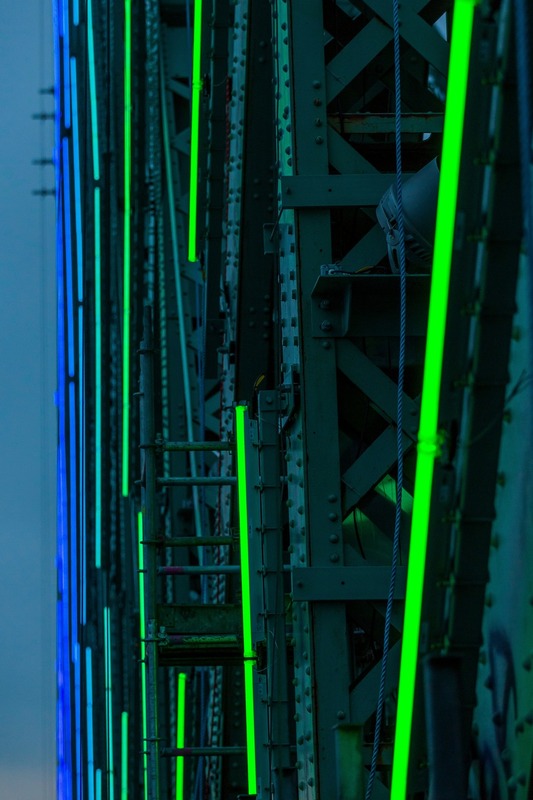 + 10.4 KM: length of cabling needed to illuminate the bridge (for data transfer and electrical power). 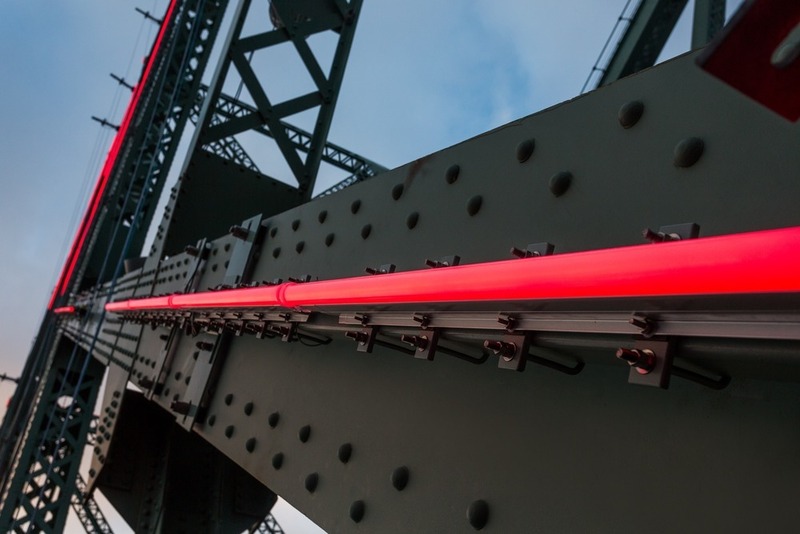 + 10,000 MOUNTING SYSTEMS: to secure the lighting fixtures to the steel supports on the bridge (about 5 per light). 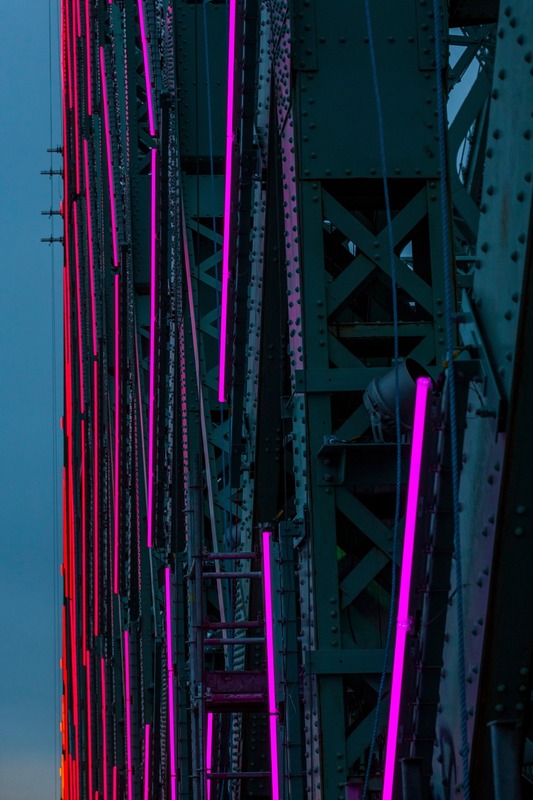 + 52 MINUTES each hour. 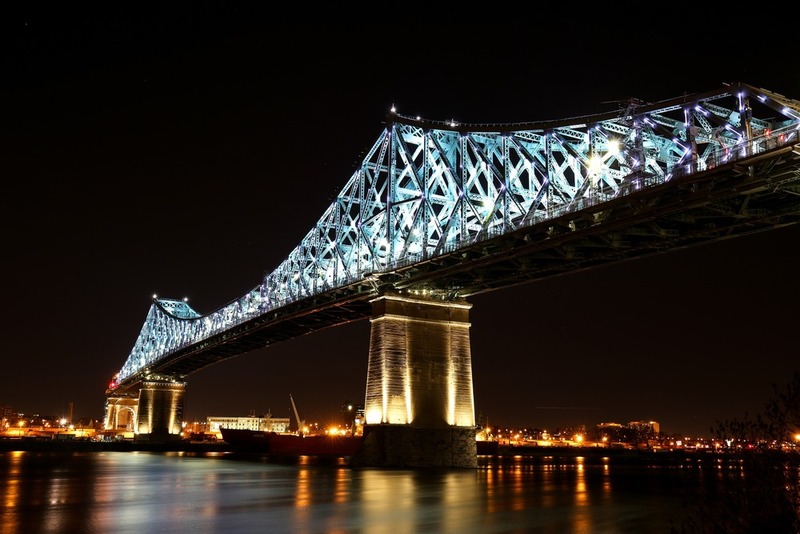 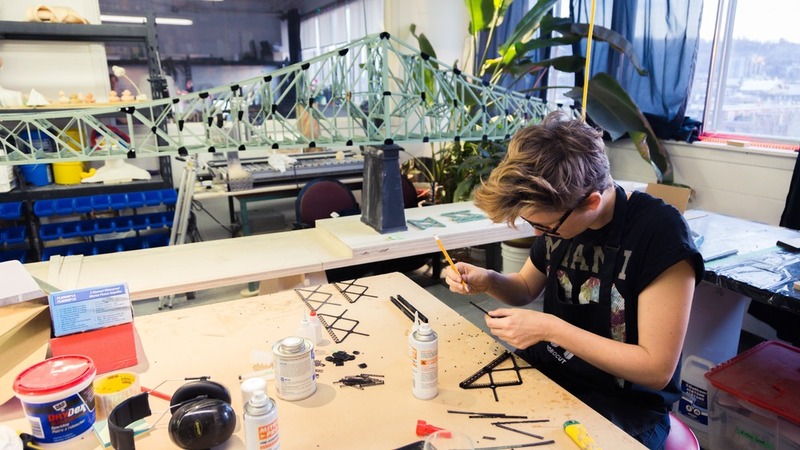 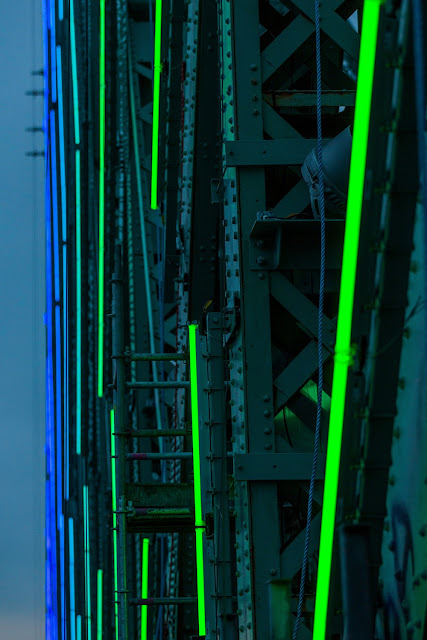 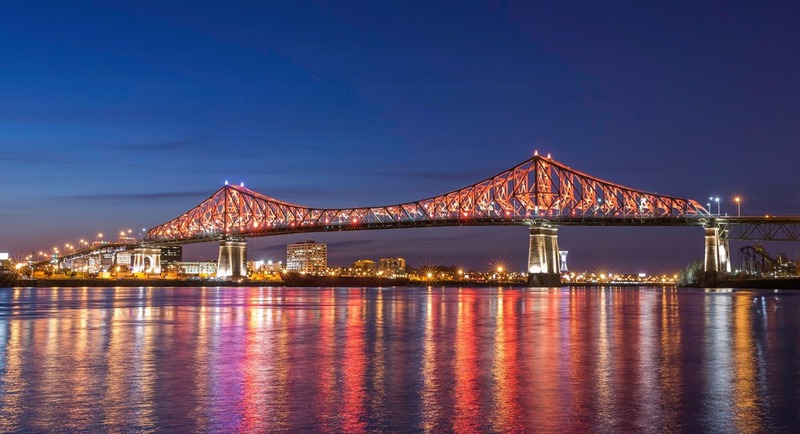 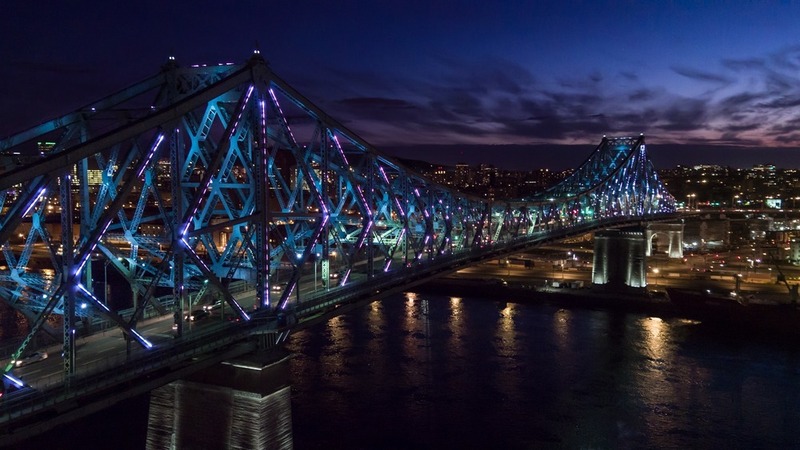 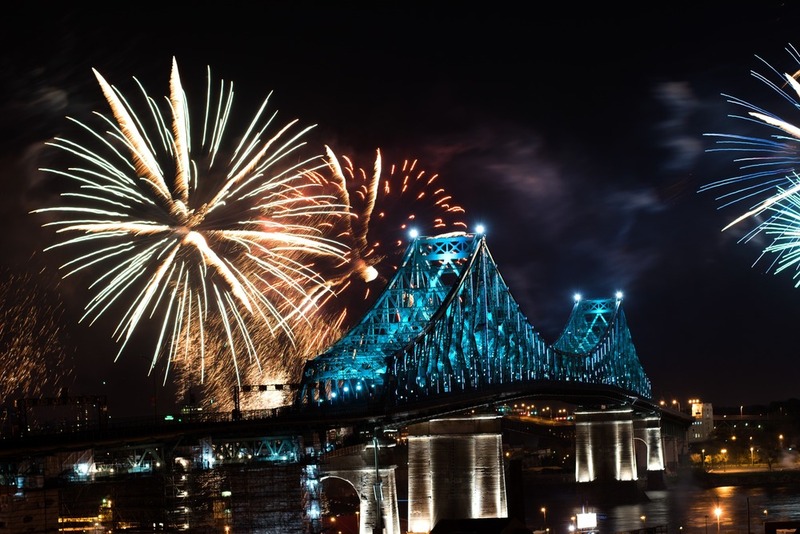 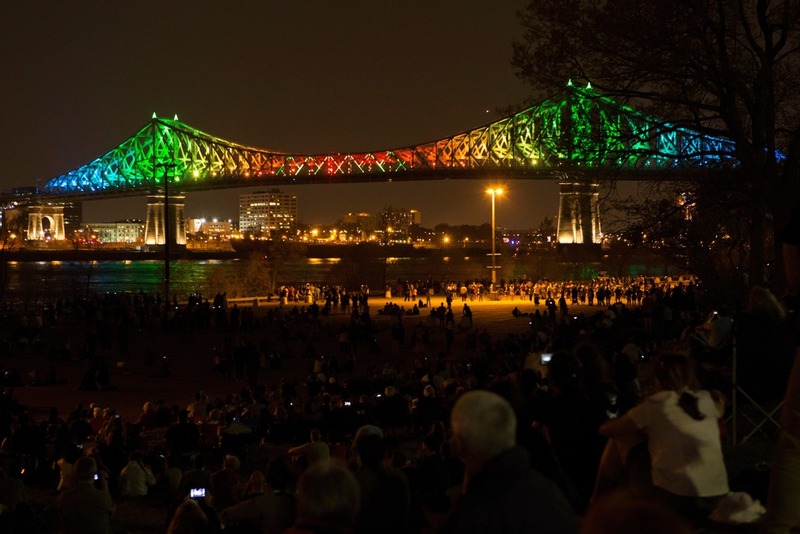 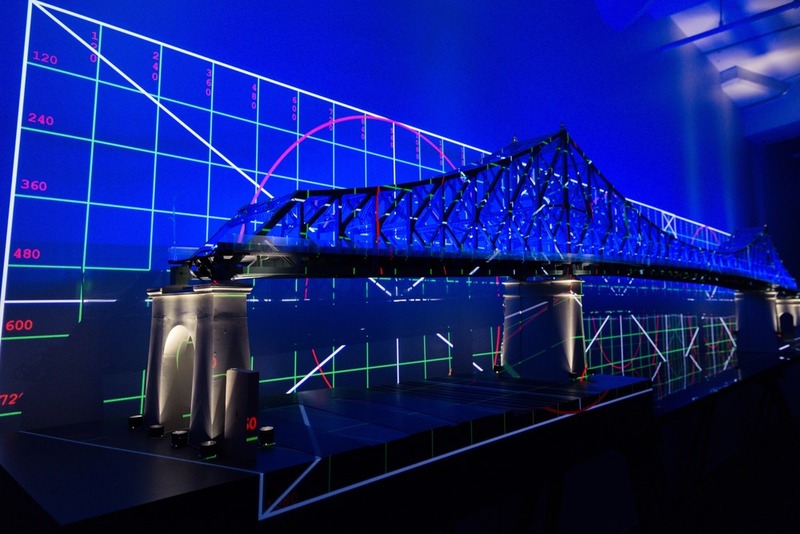 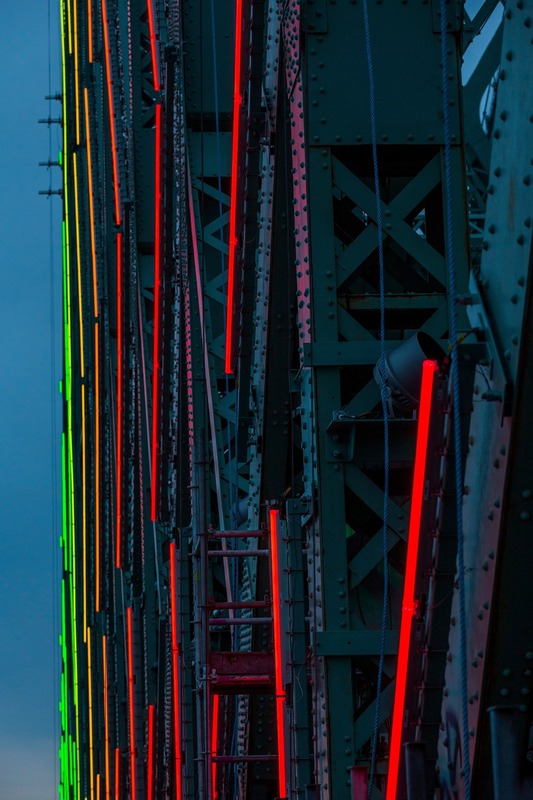 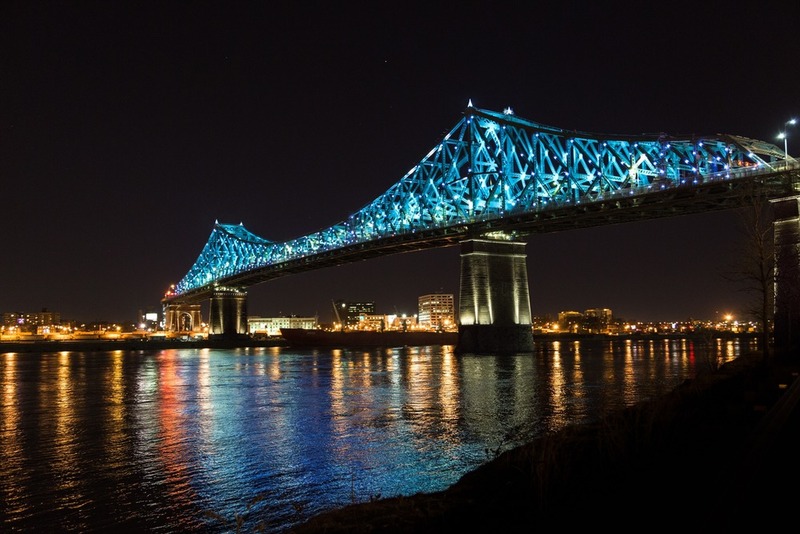 + ALL TWITTER USERS can interact directly with the Jacques Cartier Bridge, causing a point of light to appear from one of the bridge’s ‘towers’ and move across the bridge’s skin. + 2 REAL-TIME SOCIAL MEDIA feeds are used: Tweets making reference to Montréal (eg. #montreal); and Tweets addressed to bridge-specific hashtags (eg. #illuminationMTL). + 2 DISTINCT COLOURS are used to differentiate the Tweets for Montréal from the Tweets for the bridge. + UP TO 500 LIGHT POINTS, representing the most recent and most-liked TWEETS, circulate simultaneously on the bridge’s skin, before the oldest and least popular gently fade out. 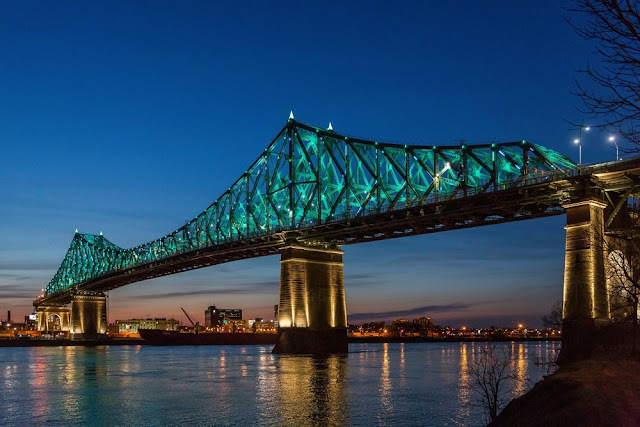 With 53 data points in 11 different categories collected every day in real time, the possibilities to mirror Montreal’s energy are infinite. 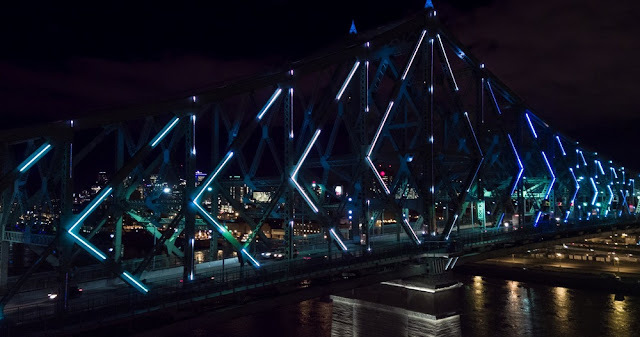 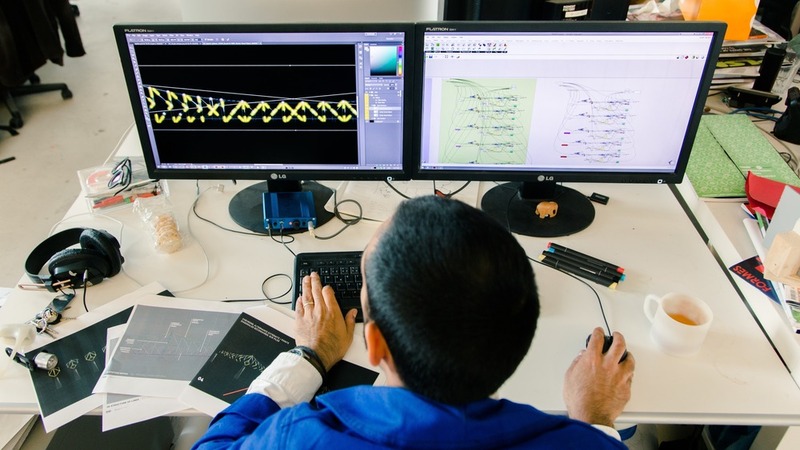 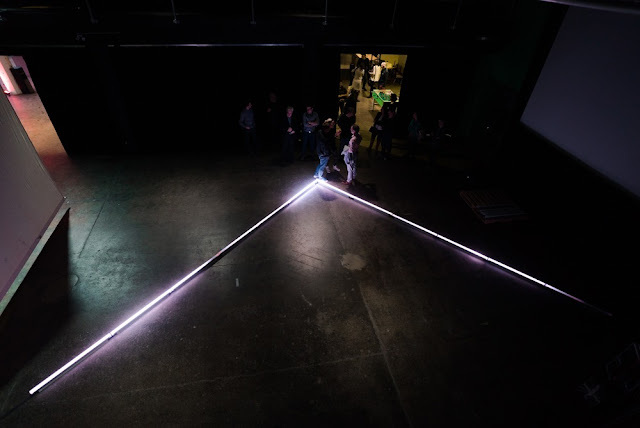 The bridge translates urban big data collected from sensors over the course of the day and updated every hour, into a series of eye-catching data visualisations. 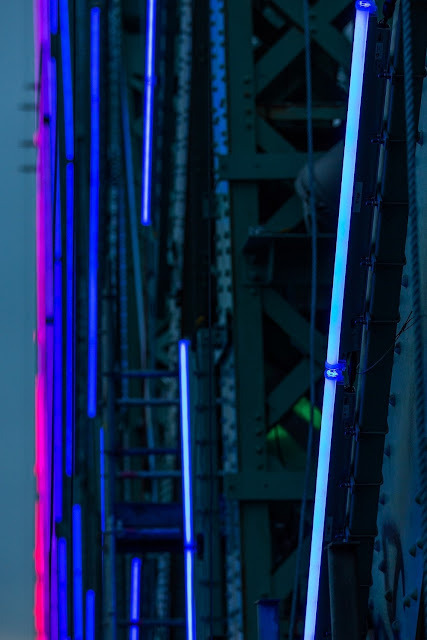 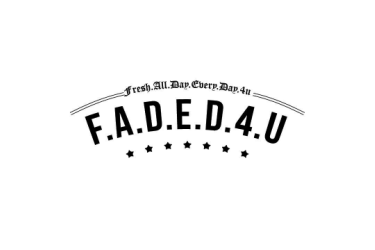 Pulling from a wide variety of data sources, including weather, traffic, news and social media, each hourly show is generated in real-time and is totally unique. 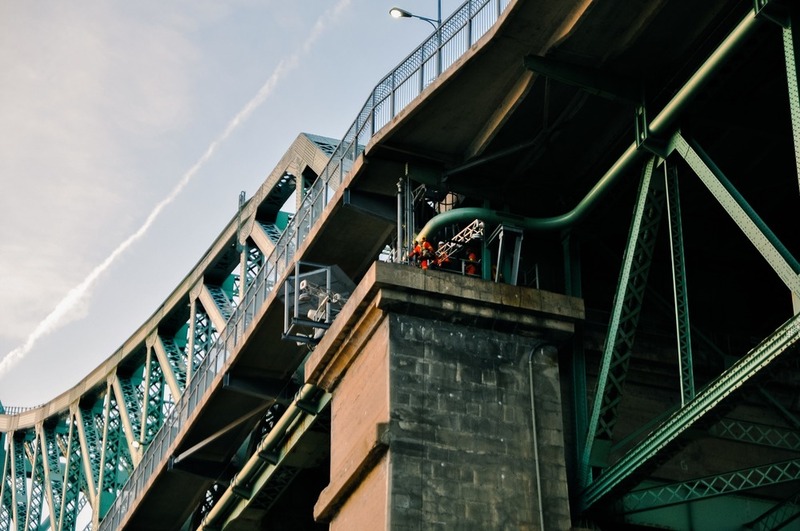 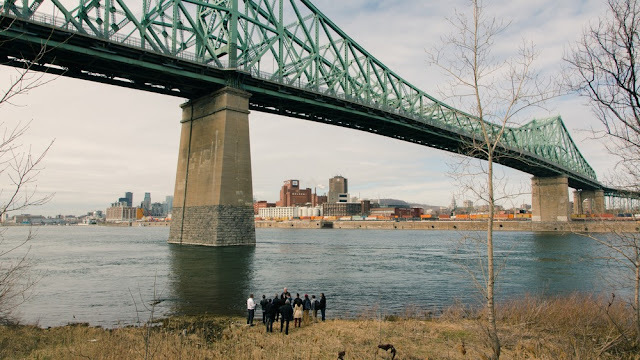 The ever-changing content makes the Jacques Cartier Bridge a true barometer of Montreal life. 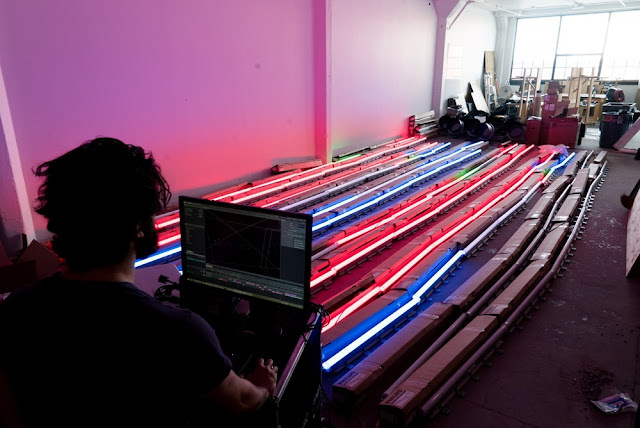 Moment Factory is a multimedia studio with a full range of production expertise under one roof. Our team combines specializations in video, lighting, architecture, sound and special effects to create remarkable experiences. 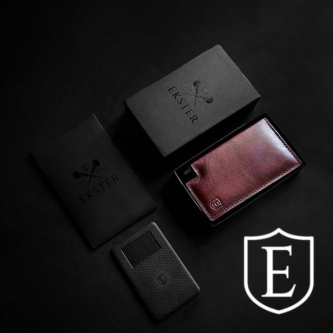 With its headquarters based in Montreal, the studio also has offices in Los Angeles, Tokyo, London, New York City and Paris. 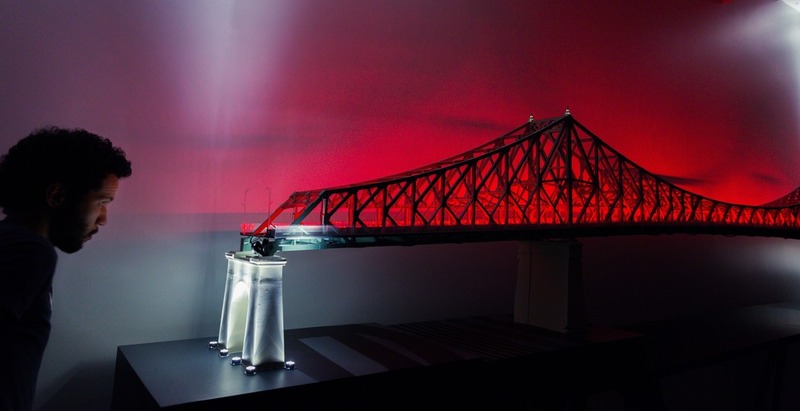 Since its inception in 2001, Moment Factory has created more than 400 unique shows and destinations. 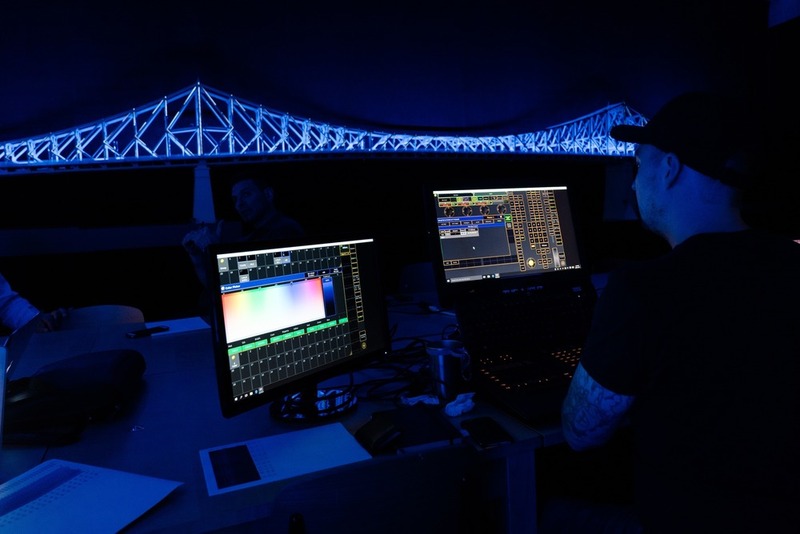 Productions span the globe and include such clients as Los Angeles Airport, Microsoft, NFL, Sony, Toyota, the Sagrada Familia in Barcelona, Madonna and Royal Caribbean.